Oktay : “I love to see brave football. 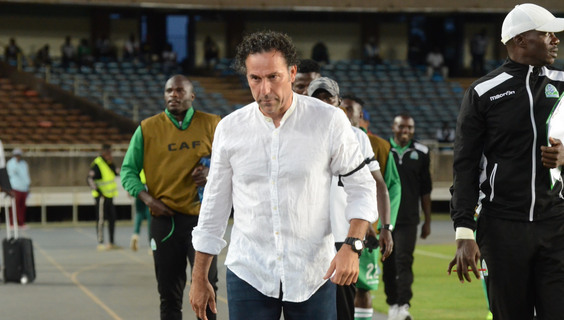 These guys, what they achieved is fantastic"
Gor Mahia coach Hassan Oktay has heaped praise on his charges after their heroic 1-0 win over Petro Atletico on Sunday to progress to the quarter finals of the CAF Confederations Cup for the first time in their history despite playing with nine men. Oktay believes the players dug deep into their energy reserves to pick the result and added the team deserved to get the qualification. “I love to see brave football. These guys, what they achieved is fantastic. Nine men, without even the coach and winning is phenomenal. I am proud of them and proud of what they have achieved,” the tactician stated. “I told them (at halftime) that they (Petro) were going to come at us and we needed to be patient and attack on the counter. They followed this instruction and we got a goal. When you play 10 men or nine men, your motivation is always high and it was like that with my boys. We should have scored more goals even with nine men,” the tactician stated. Oktay was also hugely critical of the referee’s performance having given him and his two players red cards. “It was a little bit harsh from the referee. Sometimes, I think they have to get referees who can speak the language because he thought I was arguing with him and I was not,” Oktay noted. The tactician will now plan for his side’s two legged quarter final tie and biggest on his list of work is their away record that has been nothing close to enviable. Gor lost all their away games in the group stages.